This was not something I was expecting to enjoy, especially considering how difficult it was for me to find scans of this series made me think it wouldn't be worth it. This series was something else, by now you've probably heard of it through the recent Netflix adaptation and that's what made me want to find it. Basically, the series follows the basic premise: Kantarou needs to work, but he wants some sweets, how does he get the sweets, and how does he hide that persona. It leads to some funny interactions where he will try to hide or talk his way out of being seen. 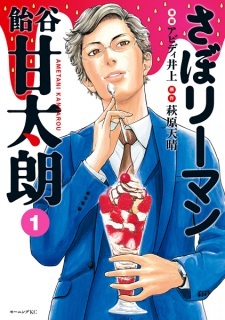 For example the first chapter, he gets approached by some newscasters and becomes the center of attention because all the women watching think he is hot, but he just wants to eat some ice cream. The biggest drawbacks are the art is kinda meh, nothing really special, but it works for the series, and the fact that it is almost impossible to find it anywhere, I only was able to read it through sheer luck and I had to read it with my very limited knowledge of Japanese. In case you want to know how hard it is to find it, the number of chapters I've read is only a number so this site will let me post the review. So in summary, the series is funny and entertaining, but is almost impossible to find. If the popularity of the Netflix adaptation leads them to rerelease the manga or makes it more accessible to read, then I would highly recommend it. But until then, I would stick with the live-action adaptation.